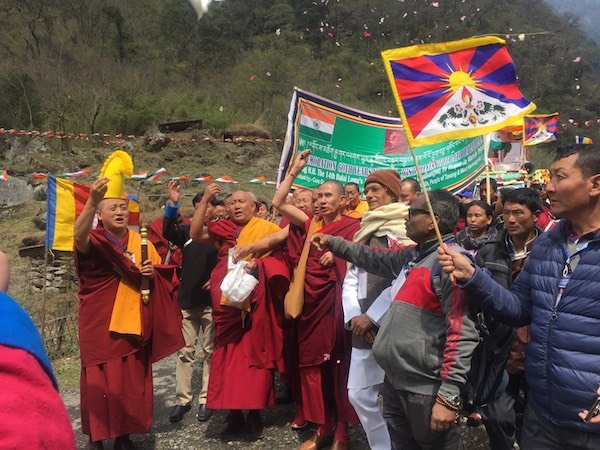 (TibetanReview.net, Mar20, 2018) – A prayer march is being undertaken across India’s northeastern states of Arunachal Pradesh and Assam as a part of year-long series of events to commemorate His Holiness the Dalai Lama’s 60th year of arrival in India for exile. The march took off on Mar 17 from Chuthangmo in Arunachal Pradesh and will conclude on Mar 27 at Tezpur in Assam. The march has been organized by the Core Group for Tibetan Cause, an umbrella body for Tibet support groups across India. Those taking part in the march include people from Tawang and West Kameng, including people from monastic and NGO communities. Chuthangmo is in Zemithang circle of Tawang district, Arunachal Pradesh, while Tezpur is in Sonitpur district in central Assam. People from both Arunachal and Assam will take part in the concluding event at Tezpur, reported arunachal24.in Mar 19. The report said the marchers will pass through Gorsum Chorten, Lumla, Tawang, Jang, Senge, Dirang, Bomdila, Rupa, Tenga, Chaku, Khelong and Doimara. The march has been organized to pray for long life for His Holiness the Dalai Lama so that his message of peace and prosperity continues spreading across the world, RK Khrimey, national convener of Core Group for Tibetan Cause, was quoted as saying.